3.6, 5, 7 1/2, 10, 16*, 33* HP! Choose your Scott-Atwater right now! 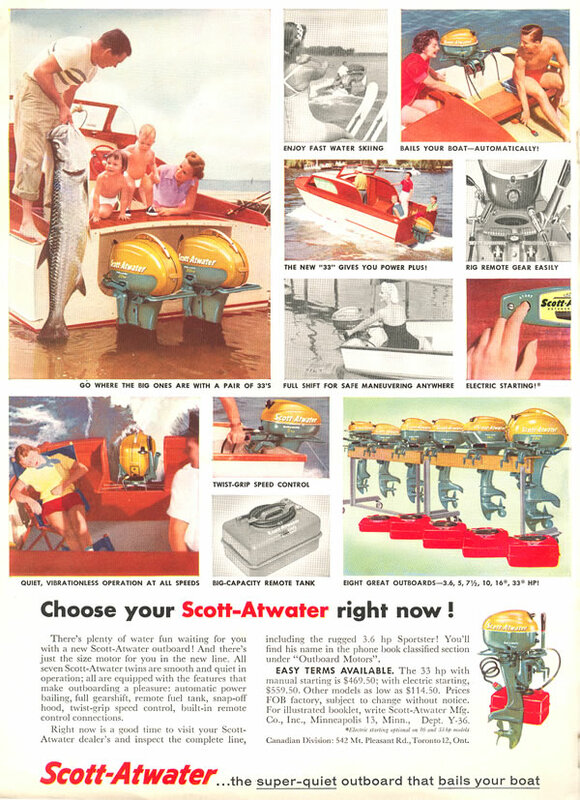 There's plenty of water fun waiting for you with a new Scott-Atwater outboard! And there's just the size motor for you in the new line. All seven Scott-Atwater twins are smooth and quiet in operation; all are equipped with the features that make outboarding a pleasure: automatic power bailing, full gearshift, remote fuel tank, snap-off hood, twist-grip speed control, built-in remote control connections. Right now is a good time to visit your Scott-Atwater dealer's and inspect the complete line, including the rugged 3.6 hp Sportster! You'll find his name in the phone book classified section under "Outboard Motors". Easy Terms Available. 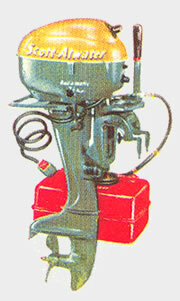 The 33 hp with manual starting is $469.50; with electric starting, $559.50. Other models as low as $114.50. Prices FOB factory, subject to change with notice. *Electric starting optional on 16 and 33 hp models. Manufacturer: Oliver Outboard Motors, 106 S. McCamly St., Battle Creek, Mich. Division of the Oliver Corporation, Manufacturers of the finest in Farm and Industrial Equipment.